Today’s challenge was a tough one and my Blooms and Butterflies knocked it out of the park. Wow!!! So, Awesome!!! I love all the designs. Thank you ladies for participating. Next week’s challenge will be announced soon. 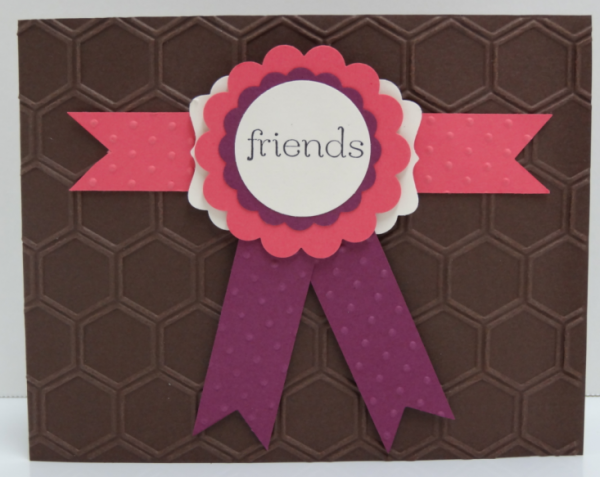 Pingback: Blooms and Butterflies Color Challenge – BB2 | My Card Scraps! 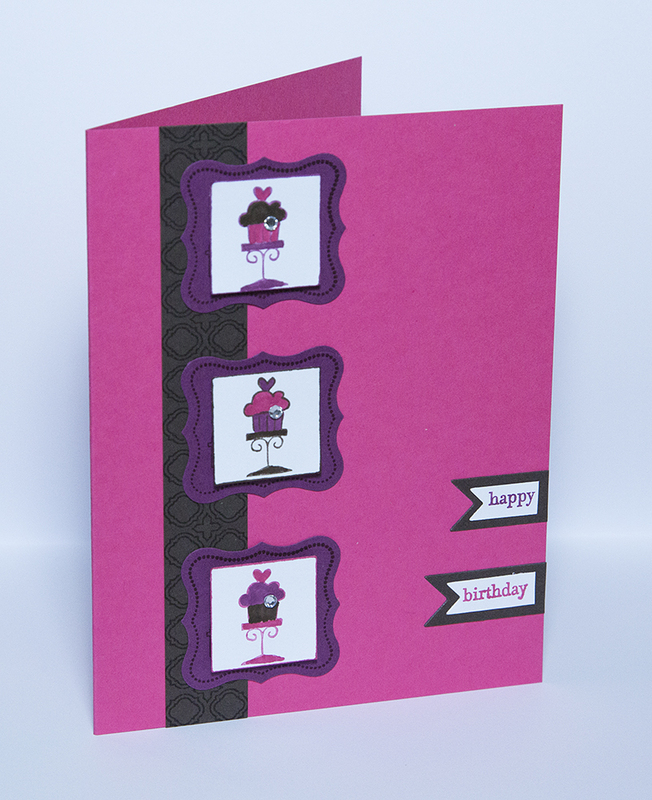 The base of my card is Strawberry Slush & measures 4 1/4 x 11″. It is scored at 2, 4, 7 1/4, & 9″. 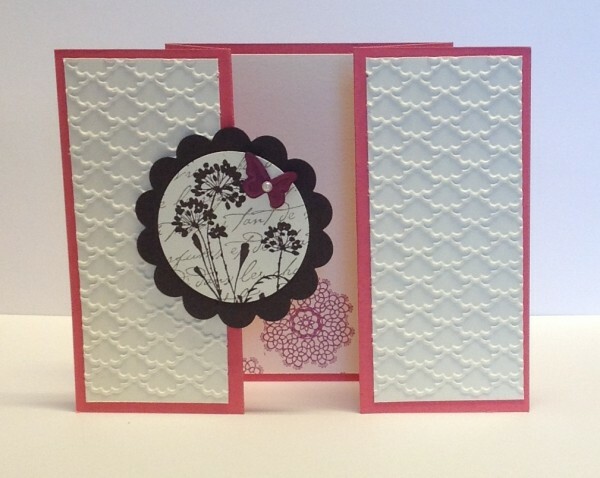 The Very Vanilla measures 1 3/4 x 4″ on the outside and was embossed with the Fancy Fan embossing folder. The inside vanilla piece measures 3 1/4 x 4″. For the center scallop, I used a retired script background stamp very similar to En Francais stamp in the current catalog. I inked it with Early Espresso and stamped off onto scrap paper then stamped it onto Very Vanilla to get a lighter impression. I then used a stamp from Serene silhouettes and stamped on top of the script stamp with Early Espresso and punched it out. I added a Rich Razzleberry butterfly using the Beautiful Wings Embosslits. I also stamped inside with Rich Razzleberry using the Delicate Doilies stamp set. 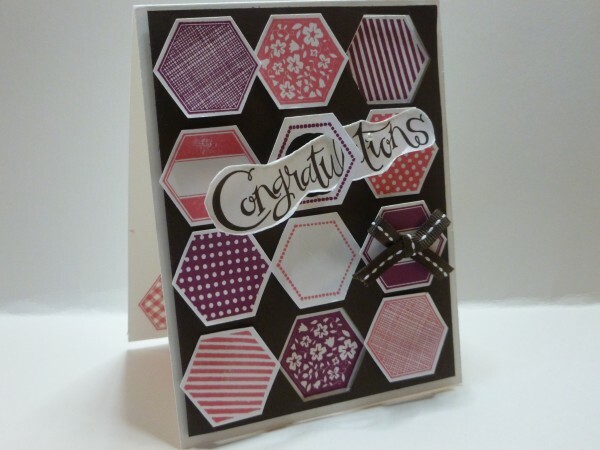 Hi there Brandy, I really like this colour combination in the cards shown here, and the designs compliment the colours, well done ladies! Love all the cards especially Dawn’s. I would like to know how she did that also. Love this color challenge. I try it and like it. Thank you. Very nice cards all. Some of my favorite colors this year were used. Like you Brandy, I love flowers and butterflies. Brandy, love, love, love these cards. 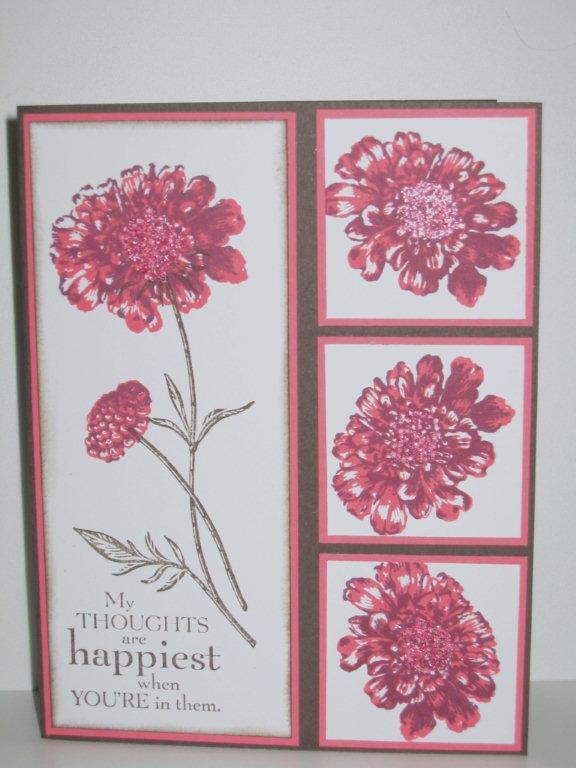 What technique did Dawn Schuldt-Benz use on her card? Really unique. Thanks to all for the great ideas. 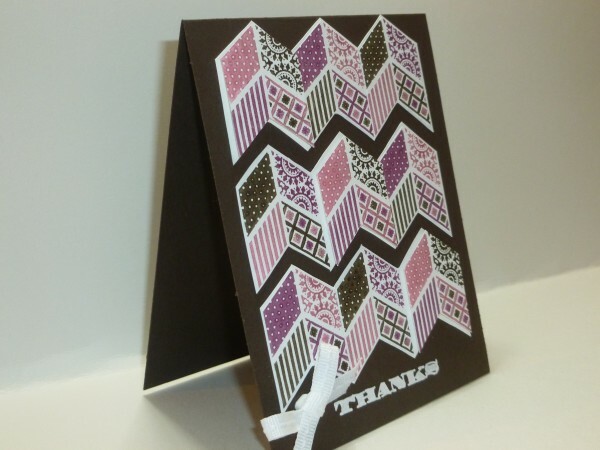 Thank you for you interest in the card, I wasn’t sure if you got the information you were looking for but I believe if you click on my name under where the card was made it would redirect you to my blog. Once there, If you click on the categories and click under BB Challenge I do have the directions there for you. I hope this helps and you have a wonderful day.